Put down your pick and give your chord playing a new lease of life with our fingerstyle workout. 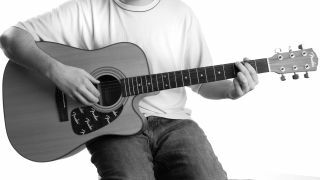 Fingerstyle is a fantastically useful technique, which you can use in all manner of styles, from acoustic folk and country to Jeff Beck and Mark Knopfler-style expressive lead guitar. We’re looking at the former approach here, with picking patterns that you can adapt to fit other chord shapes. The first example this month is a simple arpeggio using the thumb to pick the fourth string and three fingers playing the top three strings. This is a good place to start as it will give you a feel for which fingers are already strong and which ones are weak. With repetition over time your fingers will become more independent. The following examples will help you develop independence of movement in your fingers, allowing you to play simultaneous bass and melody lines similar to the likes of Chet Atkins or Ben Howard. Generally, your thumb will pick the three bass strings and your first, second and third fingers will play the third, second and first strings respectively. Hold down the chords and use your thumb (marked p), first (i), second (m) and third (a) fingers to pick the top four strings. Make sure each digit picks only one string and focus on making the flow of notes as smooth as possible, letting the notes ring out together for a sweet, musical sound. Switching between your thumb and other digits will help develop independence of movement in your fingers. Here, simply use your thumb to pick the fifth string and add the melody notes in between with your fingers. Position your pick hand thumb nearer the fretboard than your first finger so that thumb and fingers don’t collide. This pattern starts with the thumb and third finger picking two strings simultaneously – a technique sometimes referred to as a ‘pinch’. As with many fingerpicking patterns the trick is to learn it with one easy chord, then apply it to other shapes you know. Start on the C chord here, then try the others as you get a feel for it. Start by practising the bassline, which alternates between the fifth, fourth and sixth strings. Pluck all of these notes with your thumb in a downward motion. Keep repeating until it becomes second nature and then try adding one melody note at a time until you are comfortable with the whole thing. One minute: Play through each exercise slowly and check each note sounds clean. One minute: Play through each exercise slowly with a metronome. One minute: Increase the tempo slightly and repeat. One minute: Play the examples up to speed with the tracks provided. Once you have learnt the patterns try applying them to other chord shapes and progressions. You can also be creative with the patterns themselves, such as changing the feel from straight eighth notes to triplets or even by switching the finger orders around completely.